Responsible for maintaining project files, plans, forms, office equipment and supply inventory for Highway Design as well as providing the public, upon request, with such information as record plans, Specifications Books, and design manuals. Full size (24" x 36") plan sheets - $8.00 for first sheet, $1.00 each additional sheet in the same project. Half-scale (11" x 17") plan sheets - $.50 per sheet or $30 for 1/2 scale set. Legal size xerox copies (8.5" x 14") - $.15 per sheet. Letter size xerox Copies (8.5" x 11") - $.10 per sheet. Copies of Hearing Plans and other Rolled Plans - $20 for up to 10ft, then add $2.00 per ft. over 10ft. These Plans are to be made in the Print Shop. 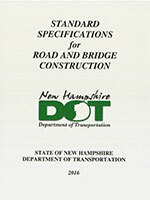 2010 Standard Plans for Road Construction - $20 per book if picked up, or an additional $5 S&H per book if mailed. Highway Design Manual $40 in binder, Volume 1 & 2 if picked up. Utility Accommodation Manual $5 per booked if picked up. Accepted payment methods are cash or check, payable to the "Treasurer, State of New Hampshire." Please attach a note with your check stating that you wish to purchase these items from the "Records Section".